oneness and our interconnected web of life. 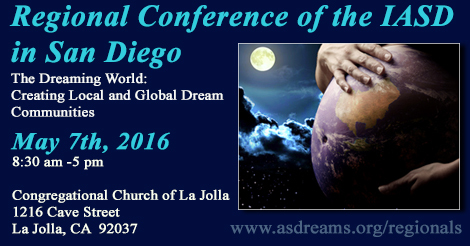 The workshop will introduce participants to “Dream Tending” a depth psychological approach to dreams. Participants will learn about the “Global Dream Initiative” and how dream symbols are shared by people around the world in what Carl Jung called the collective unconscious. The concept of “anima mundi” the soul of the world we be explored as we consider dream symbols during our ecologic crisis. Participants will learn ways to listen more effectively to dreams and dream sharing as well as how to lead a dream group and how to create dream incubation that will improve dream recall. Jungian ideas about how to do shadow work will be considered as we consider how we will raise our human consciousness as we honor dreams. The workshop will explore how to create a loving, interactive environment in order to welcome dreams and assure they are willing to be known. Participants will learn how to create dream incubation and how to improve dream recall. Participants will learn new skills and strategies on how to create new vital local and global dream communities. We will explore the concept of “anima mundi” and Carl Jung’s collective unconscious and consider emerging dream images at this historic time. Summarize the concept of “dream tending” as a depth psychological method to honor and explore dreams. Utilize concrete skills to welcome, listen and honor the dream more authentically in order to assure dreams are willing to be known. Create a dream incubation in order to develop greater dream recall. Practice methods for leading a dream group. Cassidy Seminars, ACE provider #1082, is approved as a provider for social work continuing education by the Association of Social Work Boards (ASWB) www.aswb.org, through the Approved Continuing Education (ACE) Program. R. Cassidy Seminars maintains responsibility for the program. Approval Period: April 15, 2015-April 15, 2018. Social workers should contact their regulatory board to determine course approval. Social workers participating in this course will receive 5 continuing education clock hours. TX: Approved CE Sponsor through the Texas State Board of Examiners of Marriage & Family Therapists. Provider #151 5 CE hours. TX: Provider approved by the TCBAP Standards Committee, Provider No. 1749-06, (5) hours general. Expires 3/31/2016. Complaints about provider or workshop content may be directed to the TCBAP Standards Committee, 1005 Congress Avenue, Ste. 460, Austin, Texas 78701, Fax Number (512) 476-7297. IL: Provider approved by the Illinois State Board of Certification #080304164719171. 5 CE Hours. CA: Provider approved by the CA Board of Registered Nursing, Provider #CeP12224, for (5) contact hours. IASD encourages its members to host regional meetings and co-sponsored events, and IASD will provide logistical and financial support to promote such events. The benefits of regional meetings and co-sponsored events are twofold. First, they help IASD members in a particular geographical region to meet each other, socialize, network, and share their different approaches to dreams. Second, they help to advance the basic mission of IASD, which is to broaden public awareness and appreciation of dreams.